As with all new trends, the ‘Factory of the Future’ is represented by different themes for different people. Read the industry press and you’ll see terms like ‘Industry 4.0’ and ‘Smart Manufacturing’ bandied about like Jelly Beans. 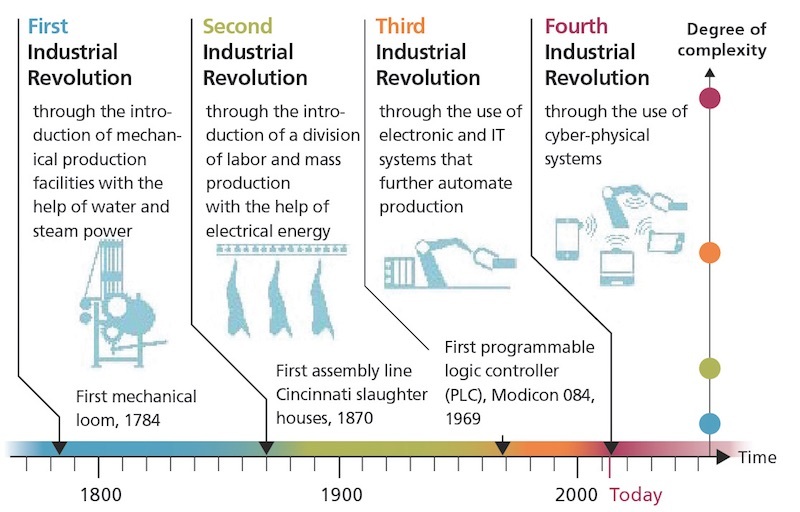 I think it describes how new technologies are creating change in manufacturing on a par with how water and steam powered mechanical manufacturing ushered in the first industrial revolution at the end of the 18th century. It’s not all IT-driven or virtual, either. New materials, production processes and consumer demand models are all serving to drive disruption. Every production process requires raw materials, so let’s look at a one example. Graphene has been widely discussed since its discovery in 2004. If you’ve ever drawn with a pencil, you’ve created it yourself. It’s considered to be a ‘2d’ material in that it’s only a single atom thick. What makes it so interesting for manufacturers is that it’s super strong, ultra-light, super conductive and thus offers a multitude of potential uses. Applications include water purification, wearable technology, lightweight aircraft and electric cars. Some scientists refer to it as the ‘miracle material’ and suggest that it will change almost every industry. Graphene is set to save lives and make you look good while doing it, too. In November 2016, Italian Momodesign motorcycle helmets partnered with graphene producer, IIT, to implement a new graphene-coated helmet product. Not only are these helmets considered to offer better protection in the event of an impact, they can be made thinner than conventional helmets. Furthermore, their heat resistant qualities are expected to reduce the damage associated with use of helmets in hot countries where high temperatures can negatively affect their structural integrity. Materials aside, the greatest driver for change in manufacturing is how both internal and external processes are being moulded by access to data. It could be through a single platform, but now that systems integration and APIs are commonplace, more likely is a series of interconnected modules that can easily share and make sense of information. The scope for useful collaboration between customers, product designers and production personnel is enormous. With robots to assist production, defect levels will drop. All this, coupled with on-demand availability of materials, will afford the production of massively personalised products, right first time and fit for customer purpose. What’s powering the data driven revolution? Information doesn’t come from nowhere. Data once came from men (and it usually was men) with clipboards; increasingly it’s from a wide array of sensors. The Industrial Internet of Things is predicated on the fact that we can get more information from more sensors, more widely distributed across a supply chain or production line, delivered in real time to more devices and processing power than ever. We don’t even need to look to industrial technology to source data: mobile phones, for example, now have a dazzling array of sensors - everything from GPS (Location), Accelerometers (tilt), Temperature and Humidity. Indeed, following the Fukushima earthquake, Sharp introduced the ‘Pantone 5’ phone with a built in Geiger counter! These low cost sensors facilitate data collection both during a production process and long after. Motorcycle manufacturer Harley Davidson increased the uptime of their Pennsylvania facility by constantly monitoring their production processes. If a machine reports an out-of-range parameter, it’s adjusted remotely to avoid malfunction. This preventative, rather than remedial, monitoring of course saves huge amounts of downtime. GE, Siemens and Cisco all operate similar arrangements. As you might expect, some of the most automated manufacturing comes out of China. In 2015, it was estimated that 75,000 multipurpose robots were in use on production lines in China. The International Federation of Robotics expects that number to double by end of 2018. In mid-2016, it was widely reported that electronics manufacturer Foxconn had cut its human workforce by 60,000; but had maintained production capacity thanks to a massive investment in robots. It’s easy to proselytise on manufacturing job losses, but I see a different trend emerging in the developed world. Step forward ‘Cobots’. 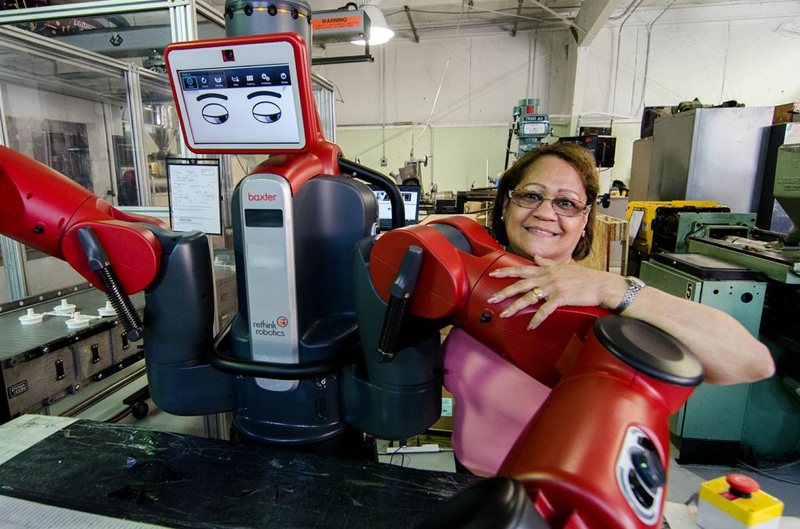 These are robots developed specifically to assist rather than replace workers. ‘Baxter’ is one such low-cost example. He comes with an SDK (development kit) so manufacturers can program him for the task in hand. He’s best suited to tasks involving danger, lifting or which require precision. At Eurodrive in Baden-Württemberg, Germany, ‘Baxter’ handles the heavy lifting. Workers report being happier: certainly they get fewer back injuries; but they also take greater pride in their work as they assume greater responsibility for the whole production process rather than a single element. It’s a good example of robots taking a simple role which allows humans to rise to more complex challenges. My sense is it’ll be a while before we see completely automated factories. Humans and robots will continue to play to their respective strengths. But there is plenty of effort and money going into researching the innovation of automation. For example, we’re seeing the growth of ‘Pilot Fabs’ – low-throughput factories using cutting edge production machines. They allow manufacturers to test techniques before rolling them out and making major balance sheet commitments. Austria doesn’t immediately spring to mind when you think of manufacturing, but the Austrian Ministry for Transport, Innovation and Technology has invested 80 million Euros to develop just such initiatives. 50 million of that investment will be spent on a new research centre – all to advance the state of manufacturing for the country. As new technologies and processes come on-stream, we can expect to see manufacturers being more nimble and efficient through better use of software. Step forward ‘Bombsheller’, a US firm manufacturing ‘graphic leggings’. An artist community provides the designs. These are rendered into 3d realistic images of the finished product. Customers choose the product they want and, only at that point, are the designs printed onto material. An on-site seamstress then stitches the fabric to shape for the customer. This ‘made to order’ approach means the firm spends nothing on demos and never holds large inventories in its own warehouse or with retailers, which might otherwise end up in clearance sales. As ‘self-driving sewing machines’ such as ‘Sewbo’ overcome the challenge of robots handling fabrics, it’s entirely possible that the clothing production process could be fully automated. Through a comprehensive use of software across the production process, businesses like Bombsheller challenge the preconception that producing clothing involves bulk ordering of materials and cheap labour; and that economies of scale can only come from mass production. Through designs coming from an online community to manufacture taking place onsite, the production cycle is reduced from what would be months to just days – whilst personalization and customization are embedded as standard. As production costs rise in the East, so we are seeing an increase in near or re-shoring – repatriating production work back to the developed world. Bombsheller demonstrates how new software and manufacturing techniques can make small garment manufacturers both efficient and profitable. I also find it interesting that the Bombsheller example suggests how the playing field between large and small manufacturers could become more level. Larger firms are bulk players, refining their lean manufacturing processes; the smaller firms are scaling up by taking advantage of emerging technologies and trends. We’ve looked at some of the physical processes shaping manufacturing. However, it’s ERP (Enterprise Resource Planning) systems that monitor and manage the whole supply chain, providing visibility to manufacturers around their business processes. At least, that’s always been the promise. Like all major software implementations, it’s had the capacity to be a silver bullet, a millstone around everyone’s neck, and usually something in between. It can facilitate data driven re-engineering of business processes. Equally it can come at a high financial and human cost. Areas ripe for disruption in the future of ERP systems include the Industrial Internet of Things (IIOT), Wearable technologies and Big Data analytics. By 2020, research firm IDC predicts that 40% of data generated globally will come from machines. Further predictions estimate that this flood of digits will emerge from 20 – 50 billion connected devices. Pirelli, the tyre manufacturer, already offers ‘smart tyres’ with sensors installed. These not only inform drivers and the onboard computer about friction, pressure and suspension loads, but also give Pirelli real-time information about likely demand levels. The increase in cheap sensors will open up huge opportunities for ERP going forward, as every aspect of a production system is measured and optimized. You’ll no doubt be at least familiar with consumer facing wearable technology like Nike’s Fitbit, which converts movements into usable data. It’s likely that we’ll see more wearable technologies entering manufacturing. There have been early experiments, including ‘Plex’ which used Google Glass. It’s been quietly downplayed since Google dropped the consumer facing Glass initiative, but opportunity abounds nonetheless. Expect to see increased use of body cameras to monitor safety and efficiency in production areas. Smart watches are an unobtrusive and easy to carry medium to check off production processes and even stop/start the processes themselves. The use of Near Field Communication (NFC) sensors could eliminate the need for scanning inventories altogether. Doing so reduces errors and increases efficiency. My sense is we’ll see a mix of body cameras, watches, NFC and other sensors, all feeding into ERP systems to provide better, real-time data to management. More data doesn’t necessarily mean better decisions, though. Expect to see greater integration of ERP and Big Data; indeed, we won’t refer to big data as such anymore – it’s just data. But it’s sometimes said ‘we’re drowning in data, but starving in insights’. While some jobs are being eroded by technology, one that for sure is not, is Data Scientist. Making sense of all the data generated by sensors at every stage of a manufacturing process will be increasingly critical. Some speculate that data scientists themselves will be redundant in 10–40 years from now as artificial intelligence takes hold, but I feel we shouldn’t ignore the over-riding human factor – critical thinking. It’s something machines just can’t handle well. Knowing which data points to correlate and which to ignore will be critical to ERP systems and the organizations they serve. Far more data driven decision-making based on real time information. Software systems will be cloud based, with greater interoperability between modules from multiple suppliers. Products will be substantially more personalised – allowing customers greater specificity over features. Constant pressure to become more efficient could be the difference between success and failure for many manufacturers. Ideas for new product development will come from real time customer usage through in-built sensors. My sense is that new technologies and materials will see manufacturing work in a similar way to software. Products will be more easily updateable and preferences accounted for on a case-by-case basis. We will also see shorter supply chains as raw materials are increasingly ‘grown’ rather than extracted. Interesting times indeed!